I never have enough kitchen space. How about you? Do you slice vegetables on a saucer? Is your toaster resting on the stovetop? We both need more space in the kitchen and I have a few ideas. Hanging pot racks have become quite popular in America and will give an Old Country feel to your kitchen. Wire Baskets are easy to hang with a single hook and are great place for fresh fruits and vegetables. Tomatoes and peaches should not be refrigerated! Hang It from the Walls – Wall space is usually wasted. 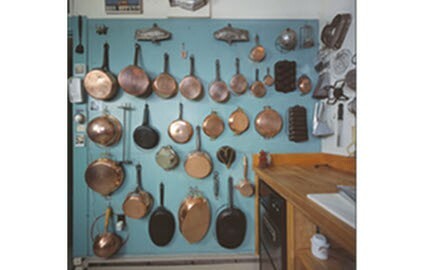 You can hang almost anything on your kitchen walls, a la Julia Childs. I personally hang all of my kitchen knives on the wall with magnets. Knives on the wall are less likely to bite you compared to knives in a drawer. Plates and serving platters with cracks and chips need to go in the trash. You will never use them! This applies to anything else that is chipped or damaged. Do you ever use that juicer? Unused appliances take up too much space. Donate them to hotline. Go through your drawers and cabinets. You will find things that you bought years ago and have never used. Be sweet and give those useless items to your friends (or enemies). Should this be in the kitchen? Kitchens collect all kinds of clutter. If it doesn’t belong in the kitchen you need to put it in its proper place (the trash?). Hide Small Appliances – Now that you have clean out your cabinets, you will have plenty of space for hiding small appliances. The toaster, can opener, rice cooker, etc. need to go in the empty cabinets. After all, how often do you use them? Get Rid of More – You have a ton of stuff that is used in the kitchen but doesn’t need to be stored in the kitchen. Cookbooks, dry goods, the kids’ quick lunch in a can, these can all be stored in a handy closet that is close to your kitchen. Now look at how much extra space you have in the kitchen! What? You want even more space? Don’t worry, we will come back to this topic soon and you will have so much free space that you will need to go shopping to fill it up. Stay tuned. If you need extra room in your kitchen and these tips can’t cut it, call Outer Banks Custom Kitchens. Outer Banks Custom Kitchens has decades of experience creating perfect Outer Banks kitchens and can transform your kitchen into your happy place. Call Outer Banks Custom Kitchens today and see what we can do for you!